Padampa Sangye (Tib. ཕ་དམ་པ་སངས་རྒྱས་, Wyl. pha dam pa sangs rgyas; Skt. Paramabuddha) (d.1117) — the great Indian siddha visited Tibet and Bhutan several times. His main disciple was Machik Labdrön (1055-1149) who founded the lineage of Chö in Tibet and Bhutan. 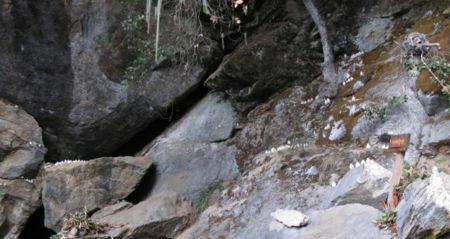 Both he and Machik Labdrön meditated in caves near Taktsang Monastery in Bhutan. Padampa Sangye and Chökyi Senge, Lion of Siddhas: The Life and Teachings of Padampa Sangye, translated by David Molk with Lama Tsering Wangdu Rinpoche, Snow Lion Publications, 2008. Dilgo Khyentse Rinpoche & Padampa Sangye, The Hundred Verses of Advice—Tibetan Buddhist Teachings on What Matters Most, Shambhala, 2006. This page was last edited on 30 July 2017, at 05:07.